Joe Hoyt's art practice is based around drawing. The paintings in this exhibition are reconstructed from drawings using a labor-intensive stippling technique comprised of very small dots of ink. Hoyt starts with sketches made around the city as a pedestrian, as someone with time on his hands and a compulsion to draw. Through the stippling technique, which takes a very long time to build up an image, he isolates a few elements of the scene, capturing them in a sort of hyper-focus. "It seems to me that this is often the way we experience the world," Hoyt observes, "Our eyes focus our vision to discreet points and visual events, which are separate from the glaze of the peripheral." The paintings become about memory. By reconstructing the scene from a sketch, Hoyt explores the the fuzzy, yet vivid, aspects of our memories. "I hope with these paintings," Hoyt says, "to achieve a more realistic record of places and scenes (our surroundings) than is possible with a photograph." 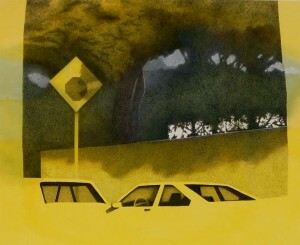 More of Joe's work will be exhibited in March at Aran Cravey Gallery in Venice, CA.